Many are called but few are chosen! You’ve heard that statement before, but how many of you have BEEN “chosen”? Well, I am one, and sometimes being “chosen” is not exactly the honor you want. Ouch! Why the “Ouch”? Well, out of the multitudinous ranks of naval, and even military aviators, I was selected to train for, qualify and prepare to drop nuclear weapons. Yup, I was selected to drop a bomb that would eradicate 15-20-30,000 people. Some honor! For me this was the first complication. 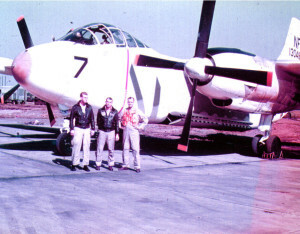 This was in 1953, and I had already flown multi-engine aircraft since 1947. I flew the four-engine kind that lands and takes off from airfields , and by now I was a fully qualified “Plane Commander”, so I was expecting to fly an aircraft of the same sort for the new squadron assignment, but this was not to be. Note that the new aircraft mentioned above WAS a “bomber”, and as such the navy needed plane commanders to fly it, so I qualified there, BUT this new flying machine had a tail-hook on it so that it could take off and land on aircraft carriers, and this left me on more shaky ground. Yeah, I had made six carrier landings in a small training bird on a jeep carrier in Pensacola before I receive my wings, but that was six years earlier. I hadn’t even thought about carriers since those initial qualifying landings. But this new huge “Savage” was an entirely new breed of cat, and I would have to learn to be catapulted off and then land it back on an aircraft carrier. This was hurdle number one. A hurdle I managed to clear after about six months of additional training and practice. But hurdle number two was different. Hurdle number two was “The Bomb”. And this bomb was not some 500 pound chunk of iron full of high-explosives. I knew about that. This thing was huge AND its guts were nuclear. 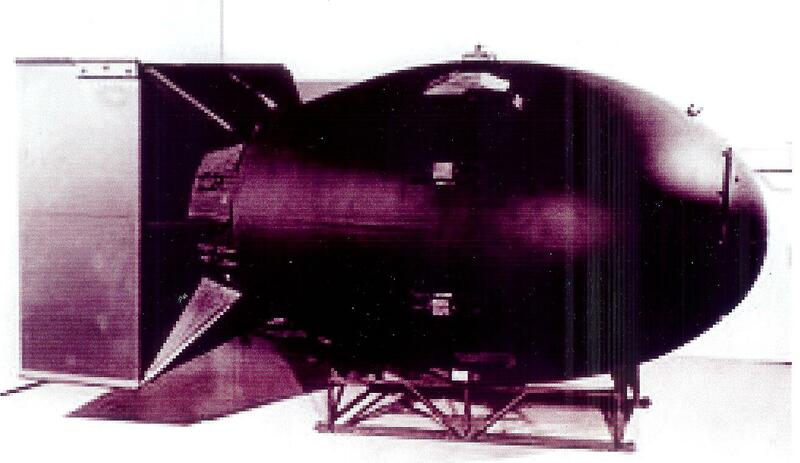 This baby was an updated version of “Fat Man”, the bomb used just eight years earlier in 1945 in the second atomic explosion over Nagasaki. Now ‘Fat Man’ was a plutonium bomb, and it worked by placing a small empty sphere of plutonium inside a surrounding layer of high explosive. When triggered, the high explosive crushes the uranium ball into itself and brings it to critical mass. This causes the atomic explosion. The original Fat Man was five feet in diameter and10 feet 8 inches in length. Mine measured out the same, and as mentioned above, it weighed 10,850 pounds. No small bomb and no lightweight! NOW let’s consider “In Flight Insertion”. 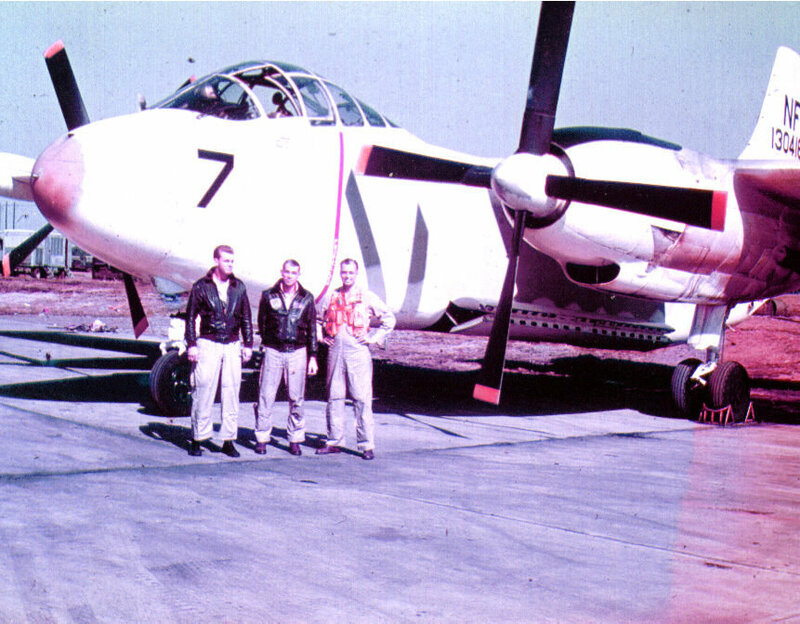 We (the three man crew) had to haul the nuclear core aboard the aircraft and on the way into the drop area we had to insert the core into the nose of the bomb, then button-up the exterior casing for the drop. In a way I guess you could say it wasn’t too hard, once you learned the technique, but it was. First, as mentioned, you had to lug the radioactive core up into the plane to the crew compartment. The core itself weighed about 14 pounds, but it came delivered in a lead bucket to shield everyone from the radioactivity, everyone on the ground anyway! I can’t remember exactly, but that combination weighed at least 50 pounds and the entry to the aircraft was up a fairly steep ramp from below. This meant dragging the bucket under the aircraft, hoisting it up the six foot chute to the flight deck for insertion into the weapon. Now, in flight, enroute to the target, the third crewman had to disassemble the front end of the bomb, position a long chute for the core to run down, then push the core into the bomb itself with a ramrod (presumably all the crew had received a heavy dose of radioactivity by that time), Lastly, the front of the bomb was reassembled, fuse set for the optimum explosive altitude, and then left hanging and ready for the drop. This was all done while wearing an oxygen mask and bulky high-altitude clothes. Oh yes! There was also “pressure breathing” to contend with. The Savage was only slightly pressurized, and so, at altitude, there was not enough atmospheric pressure to push the oxygen down into your lungs where it could be picked up and redistributed to your blood. To overcome this, the oxygen mask “reversed itself” and forced air into your lungs. After each forced inward breath you had to literally “blow out” the oxygen-depleted air, to repeat the forced air exchange. This wouldn’t be hard if you did it all the time, but it is disconcerting when you are involved in a delicate and precise operation and have rarely experienced having air forced into your lungs..
Of course, this was not the only concern – in fact it was rather a small one compared to possibility that we would actually have to drop this bomb. It’s not every day that you have to contemplate the possibly that you would probably incinerate a city full of people if you made the drop. Further, most of us wondered if WE would survive the mission anyway. I don’t remember any of us who were maudlin or fateful about this, you get over that nonsense quickly when flying in the military, but enemy anti-aircraft and fighters aside, would the aircraft be badly damaged or destroyed by the blast and would we survive the split-S (a maneuver in which the aircraft is inverted and then goes into a dive), back to the aircraft carrier? Also, would the carrier be there? It was policy to launch the attacking aircraft and then have the ship turn and run away from possible enemy counteraction. On one of my assigned targets I calculated the distance and fuel use and found that I would run out of gas maybe fifty miles offshore. When I mentioned this to the powers that be, I was informed that they knew this, but that they planned to station a submarine at some designated reachable spot and I was to ditch the plane there for rescue. Uh Huh! And the Easter Bunny really does color eggs and hide them around the lawn. Soooo, many are called and few are “chosen”. If the time comes for you, I suggest that you reverse your direction, turn off your hearing aid if you have one, and casually whistle as you leave!